Cocktails play a whimsical, harmonic, fuzz-and-synth-laced brand of power pop with boy/girl harmonies that harkens back to bands like Imperial Teen, The Rentals and that dog. 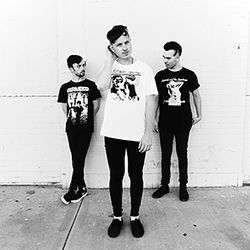 They bring the catchy, garagey goods in healthy doses on their debut album, Adult Life, which is out now. Catch the band live at Amoeba SF Jan. 31 at 2 p.m. and get a FREE Converse Rubber Tracks split 7” with Windham Flat, who recently played Amoeba SF as well. Have you guys seen the nature of the SF music scene change along with its changing demographics? Are kids still coming to rock shows? Patrick Clos: For sure. There definitely used to be a lot more like local, scuzzy guitar rock/garage/psych type bands playing around and such, but you know how it goes—there’s no longer rooms for like $500/month and such. But still, between here and Oakland, there’s no shortage of rock bands. Amoeba is teaming up with Converse Rubber Tracks to host in-store live show series with cool local bands and giving away limited split 7” to celebrate the shows. First up on Jan. 15 at 6 p.m. is Tennis System at Amoeba Hollywood. The first 500 people will get a free limited edition 7” including a track each by Tennis System and So Many Wizards. 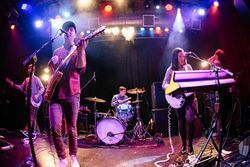 Composed of frontman Matty Taylor, drummer Hector Gomez and bassist Zach Bilson, L.A.-based shoegazers Tennis System put out their excellent second album, Technicolor Blind, in 2014. They’ve played with the likes of Ty Segall, Wavves, Japandroids, The Pains of Being Pure at Heart, Mark Gardner (Ride) and Beach Fossils, to name a few. And they’re favorites at local post-punk night Part Time Punks. The Bay Bridged - the San Francisco-based non-profit that brings you both the Phono del Sol Music & Food Festival and The Bay Brewed: A Rock & Roll Beer Festival, plus an award-winning music blog and podcast series - is holding an online fundraiser through the end of December. All donations go towards helping them produce those amazing music festivals and enables them to continue to produce their quality stories and podcasts. Every donation of $10 or more gets you a digital download of The Bay Bridged 2014 Holiday Compilation featuring songs from Everyone is Dirty, Cocktails, bAd bAd, Joseph Childress, Al Lover, Laura Weinbach (of Foxtails Brigade), and more. Donors of $50 or more will receive a number of additional benefits including discounted and free tickets to 2015 events and a chance to win some great raffle prizes such as an Amoeba gift certificate! Donate today and continue to support local music!